Don’t get us wrong, we love a bit of Netflix and chill, but with the weather heating up it’s time to put away those doonas, turn the TV off and head outside for some good old-fashioned exploring. Let’s be honest, we live in a pretty damn good-looking city! So, thanks to the boss Ford Escape (everyone’s perfect weekend accomplice), we’ve rounded up the best ways to do a totally screen-free Sunday. We promise they’re worth getting off the couch for. Launched in late October, the new Co-Ground space in Brunswick gives 100% of profits towards life-changing projects which seek to empower and educate in the Asia-Pacific region. That’s right—you can have your coffee and eat it too. Dishing out coffee from Five Senses Coffee, La Marzocco and Calmer Sutra Tea, the space is also home to a monthly artist market. From The Otways along the Great Ocean Road to the Grampians, turn your Netflix-free Sunday into a Netflix-free weekend and prepare for your Instagram to get a serious #inspo boost. 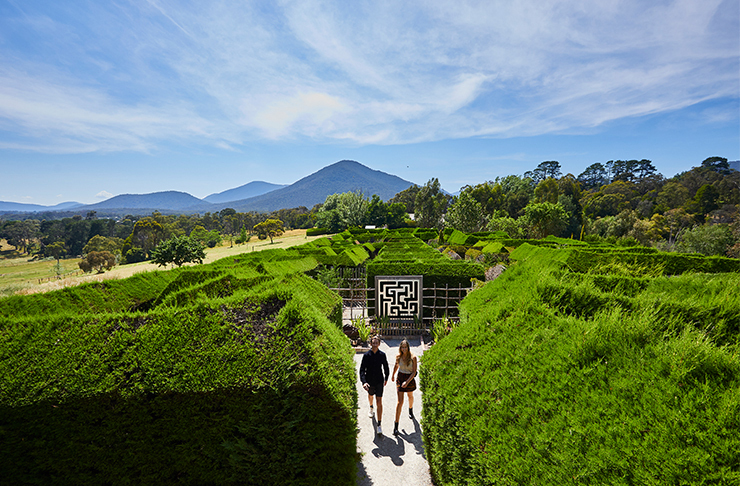 The Hedgend Maze stretches over a casual 1.2km. Entry will buy you access to their Native and Rainbow Lateral Thinking Maze (we won’t spoil the surprise). The grounds also contain a mini golf course (the dream!) and Frisbee golf course. As the designated driver you’ll (obviously) not be keen for more than one glass of wine at Mornington Peninsula’s newest winery, but luckily Kerri Greens are happy for you to BYO picnics and set up on their grassy lawns. Bring your favourite kid-friendly drinks, cheese and chocolates, and we promise you won’t miss the wine. The Cat Café Melbourne is populated by rescue kittens and cats, so you’re guaranteed to have a paw-some time. Coffee and snacks are available inside the kitty café, though we doubt you’ll be interested in food (for once) with these four-legged goddesses around. Celebrate your newfound #weekend freedom by heading south of Melbourne to pick fruit to your heart’s content. The Sunnridge Strawberry Farm is a favourite, offering DIY strawberry picking and a drool-worthy dessert café with the likes of Devonshire Tea (all the scones) and chocolate fondue for two (we’re still not sharing). Soon to be the country’s biggest outdoor gallery, the Silo Art Trail is a 200km long street art project which stretches across six regional towns. Artists have transformed towering wheat silos in the Wimmera/Mallee region into giant artworks. This is nek level road-tripping, people. We’ll be honest with you: there may be small humans under the height of 100cm running around the place, but it’s all worth it because Funfields Waterpark in Whittlesea has the biggest, longest and tallest waterslide around. Grit your teeth and get in the car, the park is for ADULTS TOO. 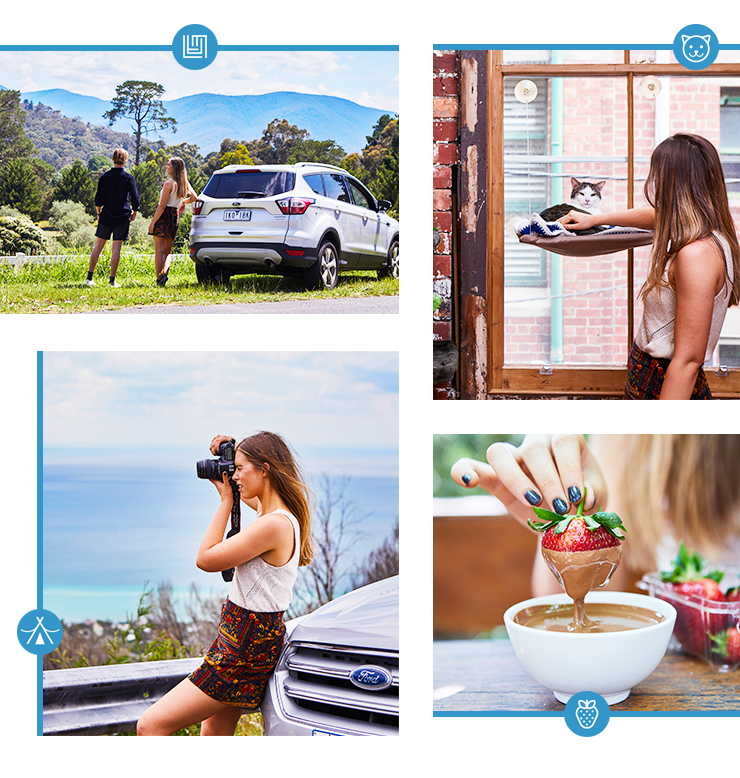 So there you have it, thanks to the Ford Escape, you now have 10 ways to really live it up on a Sunday, and there isn’t a TV in sight!